Congratulations to the Pittsburgh Penguins, but although it’s already been a few days, it didn’t seem right to write about anything other than Gordie Howe this week. Gordie Howe set records in his day that seemed unbreakable. Some of them never have been. Still, it’s interesting to note that, before the nickname made its way to him, there were several men who were already known as “Mr. Hockey.” As early as 1933, it seems that Conn Smythe was going out of his way to discourage New York writers from considering Lester Patrick to be Mr. Hockey. 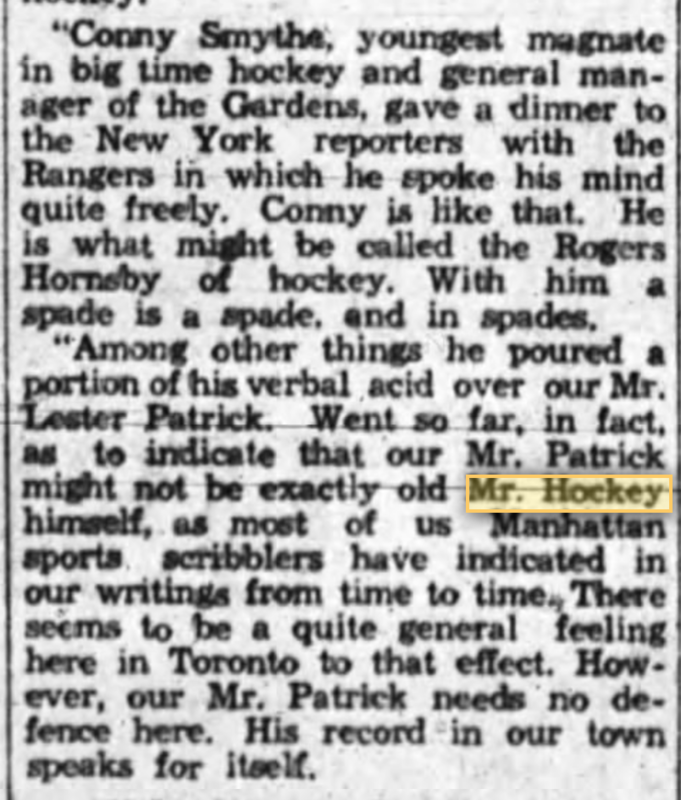 Lester Patrick as Mr. Hockey in The Ottawa Journal, April 18, 1933. 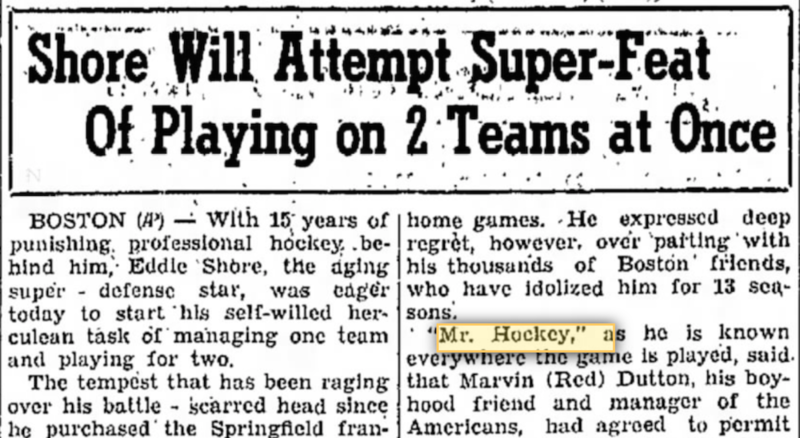 Eddie Shore as Mr. Hockey in an Associated Press story, January 26, 1940. 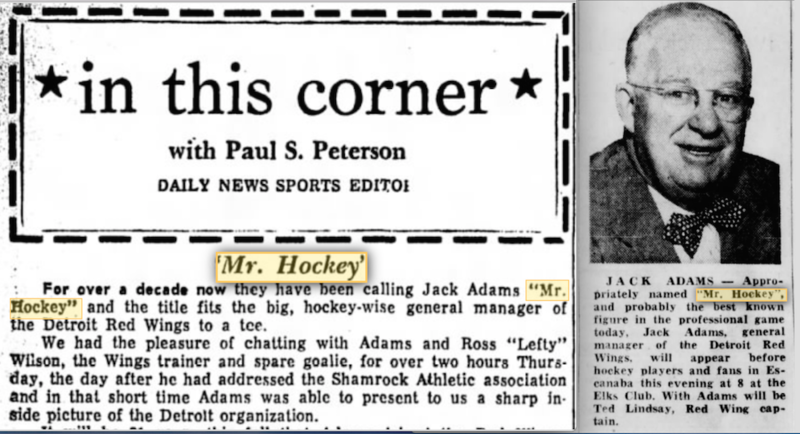 Even in Detroit, Jack Adams was known as Mr. Hockey long before anyone in town had ever heard of Gordie Howe. Adams, who was coach and/or general manager of the NHL’s Detroit franchise from 1927 to 1962, was dubbed Mr. Hockey in the early 1940s. in the 1960s; The Ludington Daily News and the Escanaba Daily Press. 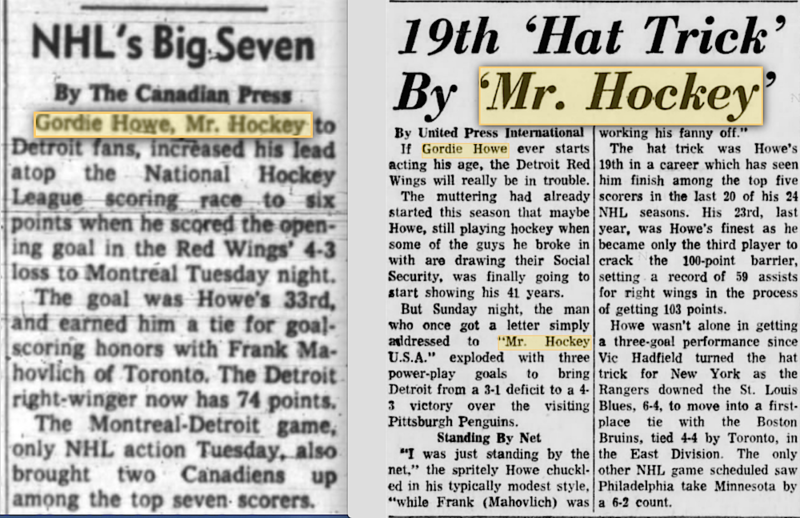 The earliest reference to Gordie Howe as Mr. Hockey that I’ve come across dates back to March of 1953. Nels Stewart (an NHL star of the 1930s and ’40s) was referring to the fact that while Maurice Richard might have recently surpassed Stewart’s NHL record of 324 career goals, Howe would likely pass them both some day. The story on the left appeared in Toronto’s Globe and Mail on March 7, 1953. The one in the right was in papers across North America on October 21, 1957. But Stewart’s quote seems to categorize Howe as just one of several Mr. Hockeys, Maurice Richard among them. The name doesn’t really seem to attach itself to Howe until after Jack Adams retired from the Red Wings in 1962, as I haven’t been able to find it again in reference to Howe until 1963. And, really, it doesn’t seem to come into widespread use until after Adams died on May 1, 1968. March 6, 1963. The one of the right ran in papers on November 3, 1969. Others have already written about this since Friday, although I’m not sure I’ve seen it put as directly as I’m about to right now: Gordie Howe is the reason we think of hockey players at their best the way we like to. The stereotype – which is generally true – is that hockey players are more approachable than other athletes; and we like to think of the best of them as being as tough as they are talented on the ice, but always humble and accommodating off of it. Great Article Eric!! Well Done! I had similar feelings when I met Gordie. Eric, I can relate to your regarding Gordie as an “old uncle.” I found him exactly that way when we had him in Eveleth in February 1972 to turn the spade for the groundbreaking of the United States Hockey Hall of Fame. Much later he was a season ticket holder of the Wild when we dropped the puck in October 2000. And now “He belongs to the ages” to borrow a phrase from William Seward who I believe uttered the line on Lincoln’s passing. Only works for people who have a subscription! Gordie Howe was my first sports ‘idol’ and ‘hero’ and I first met him through my dad and my dad’s best friend HHOFer Buddy O’Connor when they all played golf together in the fifties. I came to know him and met him many times and he was always ‘Mr. Howe’ to me. He often tried to correct me but I couldn’t bring myself to call him anything but ‘Mr, Howe’. We hung out together at various times when I was associated with, and later worked at, the HHOF whenever he visited and it was during that time that he finally changed my mind for me. One day he grabbed me in a playful head-lock (He was in his late sixties but I could still feel his biceps bulging under his jacket!) and told me, with a chuckle, “You’re almost as old as me now…it’s ‘Gordie!'”. THAT was my ‘MR. HOCKEY’! Lastly, another friend of mine by the name of Robert Marvin Hull, to this day, always reverently and humbly refers to THE MAN as ‘Gordon Howe’. With so much being written about Howe upon his passing, it is a credit to you that you have identified a unique perspective. While Howe was not the first or the only Mr Hockey during his career, he has evolved into hockey mythology as the lasting Mr. Hockey and I dare predict that with him having assumed that moniker no other player will ever again be assigned it. Thanks for the information. Glad you had a chance to meet Gordie Howe. There’s not much left to say about Gordie Howe after the publicity which surrounding his death has unearthed. However, you have picked a fresh look at his nickname which I personally find VERY interesting and enlightening. I had never come across any of those references in the 100’s of hours pouring over old newspapers, etc. Gordie Howe = Hockey! I used to sit spellbound watching him when I was a child! And to get a Hyperactive child to sit for any longer than 5 minutes was a feat for my dear Father. He’d put hockey on & I’d settle right down. So Gordie Howe helped my Father for many years, lol…..